We don't offer granite's that fade or yellow over time or granite's that have been doctored with chemicals. 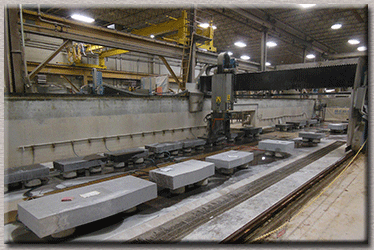 We use only the highest quality granite's available from well known and respected suppliers. In many cases we have been using the same suppliers for up to 40 years! Single process lettering saves labor but produces letters that have all their edges rounded off. Double Processed Lettering produces letters with sharp clean edges that stand out and make the letters more readable. We don't cut corners (no pun intended), we take the time to do it right - we utilize double process lettering. "Carved" artwork and lettering is carved (sand blasted) at the same time. This produces artwork that is flat - just like the letters. In order to give the artwork a lifelike appearance the monument is placed into another room where artists shape carve the artwork by hand. It's hard to see in the 2D pictures above but shape carved artwork looks MUCH better than flat machine cut artwork. 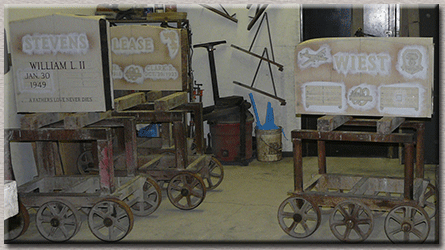 We care about the products that we produce so we shape carve artwork on upright monuments at no extra charge! Lithochrome is an industrial paint. It is a pretty expensive industrial paint but it is still paint. We all know what happens to paint over time and given enough time even the most expensive paint will deteriorate. Some monument companies will reduce the depth of the letters to save labor and apply lithochrome to compensate for the resulting lack of contrast. Some companies just add lithochrome to the letters to make them look bright. 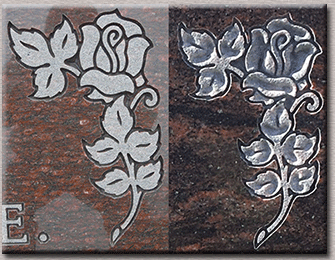 We offer both laser etching and diamond etching. Both have their advantages and disadvantages. We have put together a comparison page that explains all the differences. 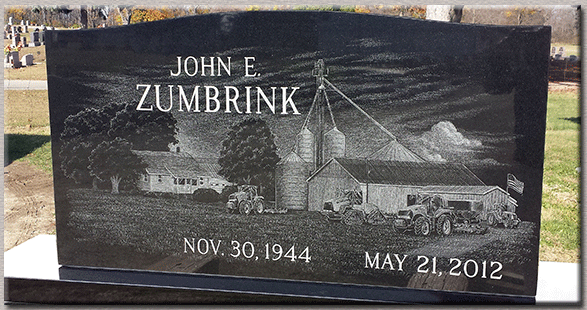 Warranties And "Extended Service Plans"
We only offer the highest quality memorials that are made. This means we only need one simple to understand warranty. 1. Vandalism in cemeteries is extremely rare - but it makes big headlines on the rare occasion that it does happen. Which leads people to believe that it happens more than it actually does. 2. 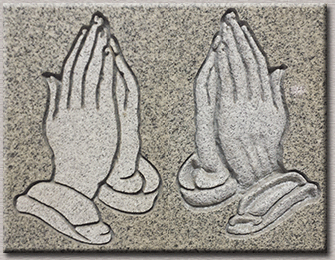 Protection against vandalism of your headstone is included in your homeowners insurance. Why do they include this in your homeowners insurance? See reason #1. We are a family owned company who stands behind what we sell. If your memorial develops a problem due to defective materials or workmanship we will repair or replace the memorial to your satisfaction for free. Plain, simple, and straight forward.